You probably know them best for books, newspapers and stationery. Now, thanks to their carefully chosen partners, they offer an increasingly wide choice of goods through their stores and website - from personalised children's books to personalised greeting cards and magazine subscriptions. In 2010 The Gadget Shop joined WHSmith to add gadgets and gizmos to their offerings. 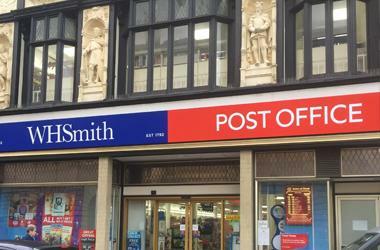 The Post Office now provide their services in the town centre via the first floor of WHSmith. There is a lift available to the first floor.